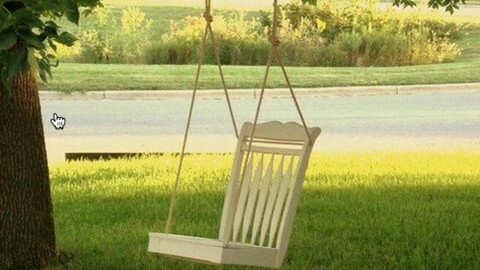 Find Your Secret Spot and Hang This Cool DIY Tree Swing! This is easy peasy! This takes me back to when I was a little girl. I used to love swinging as a child so I decided I needed a swing! Why not? I’ve enjoyed many hours swinging from my tree in my back yard. It’s such a peaceful feeling swinging with the wind in my hair. It takes me back to some great childhood memories at my grandparents. We had a treehouse too. Wonderful times were had and memories that matched. All you need is a hand saw, sandpaper, a drill, rope paint and brush…oh, and the chair of course! Start by sawing off the legs of the chair. Then drill 4 holes (for the rope). Sand the chair to remove the distressed paint and give your chair a fresh coat of paint and let dry. Bend your rope in a loop and make a slip knot, doing this four times and pulling the unknotted end through the holes. Then tie your rope around the tree branch! Watch this step by step tutorial for your hanging swing!